Family Dental Care Center of Lansdowne provides professional dental implant surgery as apart of our comprehensive service offerings. Dental implants are metal frames or posts that are surgically positioned into the jawbone underneath your gums and designed to mount and hold replacement teeth. Whether you require a denture, partial denture, or individually implanted tooth, our dental implants will provide you with the structural base to effectively install replacement teeth. Serving Lansdowne, Drexel Hill, Aldan, and the surrounding areas, our team is here to satisfy any and all dental needs. Read on to learn more about our practice and how we approach dental implant surgery. Implants will fuse to your jawbone in order to provide stable support for artificial teeth. This degree of stability means that the bridges and dentures mounted to the implants will remain in place, preventing slipping or shifting in your mouth. This function is especially important for eating, speaking, and numerous essential functions of our everyday lives. For some, regular dentures and bridges are either not comfortable, or simply not possible due to poor ridges, gagging, or particularly sore areas. Additionally, ordinary bridges must attach to teeth on both sides of the space left by the missing tooth. A major advantage of implants is that no surrounding teeth need to be ground down to mount your replacement teeth in place. In order to receive implants, your gums must be reasonably healthy and you must have adequate bone area and density to support the implant. It will also be your responsibility to keep these structures healthy. Meticulous oral hygiene and regular dental visits are crucial to the longevity of dental implants. If you are interested in dental or denture implants but concerned with the costs, check with your insurance carrier to see what they cover and what they do not. There are other options if these fall outside your coverage or your budget. There are two different types of implants that The American Dental Association considers safe. Familiarize yourself with the two procedures and ask your dentist what type is best suited for you. These implants are surgically fitted directly into the jawbone. After the surrounding gum tissue has completely healed, a second surgery will connect a post to the original implant. Finally, artificial teeth are attached to each individual post, or grouped on a denture or bridge. Consisting of a metal frame implanted below the gum tissue, this frame becomes fixed and fused to the jawbone during the healing process. Posts are attached to the frame which protrude through the gums. Just like endosteal implants, artificial teeth are then mounted to the posts. 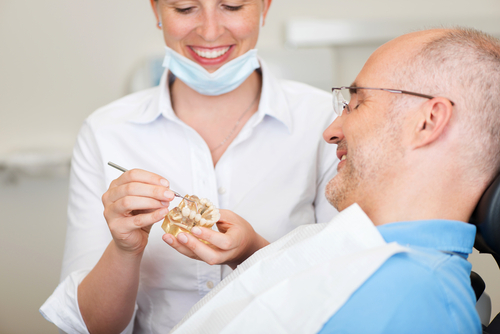 If you have already scheduled your consultative appointment for dental or denture implants and you are curious about the other procedures we offer, feel free to check out some of our related services. Serving Lansdowne, Drexel Hill, Aldan, and the surrounding communities, we look forward to seeing that big, beautiful smile walk into our office for years to come. Call us today at 484-791-2138 to see how we can brighten your day, and your smile!